(1) The Supreme Lord said: 'A soul free from desire who accepts My shelter, should practice the varnâs'rama system of behaving oneself in society [B.G. 4: 13], conscientiously performing the personal duties that I spoke about [see also in e.g. 10.60: 52 and B.G. 3: 35]. (2) A purified soul should understand that all endeavors of embodied souls who, focussed on the sensuous self, take the material qualities for true are doomed to fail [see also B.G. 13: 32]. (3) Just as the sensuous matters that the meditator sees in the realm of sleep or in his fantasy do not help him because of their messy nature, also the intelligence is ineffectual when being lead by the senses that follow a diversity of outer selves [B.G. 2: 41 & 9: 15]. (4) Devoted to Me one gives up one's active [employment] life [pravritti] and engages in a contemplative life [nivritti]; when one is fully absorbed in [self] inquiry one is no longer bound to the injunctions for performing material labor [karma, see 7.15: 47]. (5) Devoted to Me one should at all times respect the vow of yoga [yama, the vidhi] and its regulated practice [niyama] as good as one can, as also respect a guru who knows My form and is peaceful under My control [see also 7.14: 41-42]. (6) Humble without false pride and jealousy, be industrious [in devotion], non-possessive, fixed in friendship, without haste, interested in inquiring and free from spite and idle talk. (7) Remaining neutral with an equal vision towards one's wife, children, home, land, relatives and bank account and such, one should recognize one's self-interest in that of others [see B.G. 5: 18]. (8) The soul is the self-enlightened seer different from the gross and subtle body, just as fire emitting light as it burns differs from the firewood [see also B.G. 2: 16-24]. (9) Like the different qualities of being dormant, manifesting, being large or small that there are [of the fire], there are also the qualities of the material body that by the higher self, having entered it, are accepted [see also 3.24: 6, 4.9: 7, 10.37: 10-11, 10.46: 36]. (10) This body, which was constructed by the modes of nature [expanding] from the Original Person [see B.G. 8: 4], ties the living entity to a material existence [to samsâra] from which it breaks away by the knowledge of the Soul. (11) One should therefore, by cultivating knowledge, get in touch with the pure, transcendental [Supreme] Soul situated within oneself [2.2 and B.G. 9: 5] and gradually give up this concept of the material affair [as being an independent reality]. (12) The âcârya can be compared to the lower part of [a pile of] kindling wood, the disciple to the top part and the instructions to the [kindling] stick used in between, while the knowledge that brings happiness is there like the fire [that brings light, compare 9.14: 44-46]. (13) This purest intelligence of the souls of experience [the âcâryas], drives away the illusion originating from the gunas and then - being raised by those modes - finds peace itself, the way a fire burns up when it runs out of fuel [see also 11.3: 12]. (14-16) For the controllers and enjoyers of karma there is of course the eternal duality of happiness and grief, time and place, to have and to be. When you take all that is matter for eternal and complete, your intelligence is ruled by all the different forms and changes belonging to it. All living beings thinking thus oh Uddhava, again and again will find themselves being born [fall ill, die] and so on [see 3.11], after all, being united with a form one is bound to the [conditioning] limbs of time [of sun and moon, day and night etc.]. (17) In this, one can clearly see the lack of independence of the karmic controller as also the happiness and unhappiness of such an enjoyer. What purpose is served by someone [that] helpless [see B.G. 9: 3 and 11.9: 1]? (18) Among the embodied beings the fool is sometimes unhappy and even the sage is not always happy as well. Wishing to be happy always is a useless endeavor and in fact something most egotistical [see also B.G. 2: 15 and 11.9: 4]. (19) Even if one manages to achieve happiness and escape distress, one still has no direct knowledge of the [yoga] process by which death loses its power [compare B.G. 10: 34]. (20) What guarantee of material happiness would a material object or lust be able to provide the person? With death never pleasing close at hand such a thing gives no satisfaction, like with a person condemned who is led to his place of execution. (21) What we heard about [heaven] as also what we know from our own experience [earth] is spoilt by rivalry, fault-finding, lapse and decay. Just like with agriculture where many obstacles are in the way [of a happy result], it is useless to desire for [perfect] material happiness [see also 11.3: 20]. (22) When one manages to perfectly practice one's righteousness [dharma] without being troubled by hindrances, even the status one thus acquires will not last forever. Please, listen therefore to the following [see also B.G. 2: 14]. Third revised edition, loaded April 16, 2015. The Supreme Lord said: 'A soul free from desire who accepts My shelter, should practice the varnâs'rama system of behaving oneself in society [B.G. 4: 13], conscientiously performing the personal duties that I spoke about [see also in e.g. 10.60: 52 and B.G. 3: 35]. A purified soul should understand that all endeavors of embodied souls who, focussed on the sensuous self, take the material qualities for true are doomed to fail [see also B.G. 13: 32]. Just as the sensuous matters that the meditator sees in the realm of sleep or in his fantasy do not help him because of their messy nature, also the intelligence is ineffectual when being lead by the senses that follow a diversity of outer selves [B.G. 2: 41 & 9: 15]. Devoted to Me one gives up one's active [employment] life [pravritti] and engages in a contemplative life [nivritti]; when one is fully absorbed in [self] inquiry one is no longer bound to the injunctions for performing material labor [karma, see 7.15: 47]. Devoted to Me one should at all times respect the vow of yoga [yama, the vidhi] and its regulated practice [niyama] as good as one can, as also respect a guru who knows My form and is peaceful under My control [see also 7.14: 41-42]. Humble without false pride and jealousy, be industrious [in devotion], non-possessive, fixed in friendship, without haste, interested in inquiring and free from spite and idle talk. Remaining neutral with an equal vision towards one's wife, children, home, land, relatives and bank account and such, one should recognize one's self-interest in that of others [see B.G. 5: 18]. The soul is the self-enlightened seer different from the gross and subtle body, just as fire emitting light as it burns differs from the firewood [see also B.G. 2: 16-24]. Like the different qualities of being dormant, manifesting, being large or small that there are [of the fire], there are also the qualities of the material body that by the higher self, having entered it, are accepted [see also 3.24: 6, 4.9: 7, 10.37: 10-11, 10.46: 36]. This body, which was constructed by the modes of nature [expanding] from the Original Person [see B.G. 8: 4], ties the living entity to a material existence [to samsâra] from which it breaks away by the knowledge of the Soul. One should therefore, by cultivating knowledge, get in touch with the pure, transcendental [Supreme] Soul situated within oneself [2.2 and B.G. 9: 5] and gradually give up this concept of the material affair [as being an independent reality]. The âcârya can be compared to the lower part of [a pile of] kindling wood, the disciple to the top part and the instructions to the [kindling] stick used in between, while the knowledge that brings happiness is there like the fire [that brings light, compare 9.14: 44-46]. This purest intelligence of the souls of experience [the âcâryas], drives away the illusion originating from the gunas and then - being raised by those modes - finds peace itself, the way a fire burns up when it runs out of fuel [see also 11.3: 12]. For the controllers and enjoyers of karma there is of course the eternal duality of happiness and grief, time and place, to have and to be. When you take all that is matter for eternal and complete, your intelligence is ruled by all the different forms and changes belonging to it. All living beings thinking thus oh Uddhava, again and again will find themselves being born [fall ill, die] and so on [see 3.11], after all, being united with a form one is bound to the [conditioning] limbs of time [of sun and moon, day and night etc.]. In this, one can clearly see the lack of independence of the karmic controller as also the happiness and unhappiness of such an enjoyer. What purpose is served by someone [that] helpless [see B.G. 9: 3 and 11.9: 1]? Among the embodied beings the fool is sometimes unhappy and even the sage is not always happy as well. Wishing to be happy always is a useless endeavor and in fact something most egotistical [see also B.G. 2: 15 and 11.9: 4]. Even if one manages to achieve happiness and escape distress, one still has no direct knowledge of the [yoga] process by which death loses its power [compare B.G. 10: 34]. What guarantee of material happiness would a material object or lust be able to provide the person? With death never pleasing close at hand such a thing gives no satisfaction, like with a person condemned who is led to his place of execution. What we heard about [heaven] as also what we know from our own experience [earth] is spoilt by rivalry, fault-finding, lapse and decay. Just like with agriculture where many obstacles are in the way [of a happy result], it is useless to desire for [perfect] material happiness [see also 11.3: 20]. When one manages to perfectly practice one's righteousness [dharma] without being troubled by hindrances, even the status one thus acquires will not last forever. Please, listen therefore to the following [see also B.G. 2: 14]. On earth having worshiped the gods with sacrifices the performer goes to the heavenly worlds where he may enjoy like a god the celestial pleasures he achieved [see B.G. 3: 11 and 4: 12]. Shining in the temple [the 'vimâna'] because of his accumulated merit he, being surrounded by goddesses wearing charming clothes, enjoys while he [as he leaves this earth] is glorified with songs by the singers of heaven. Surrounded by the sounds of bells he fares to his desire with the heavenly women, but while relaxing comfortably in the pleasure gardens of the gods, he in his delight has no awareness of his downfall [see e.g. 7.15: 69-73]. After for long having enjoyed the heavens until his pious credits were used up, having exhausted his merits he against his will falls down from heaven, [not properly fixed] being forced from his course by time [compare B.G. 9: 20-22]. When he, due to his material involvement, is engaged in actions against the dharma or, not having conquered his senses, lives wantonly as a miserable, greedy philanderer, is of violence against other living beings, kills animals against the rules and worships hordes of ghosts and spirits [compare 7.12: 12], a living being will, once he passed on, helplessly thereupon land in the deepest darkness of the hellish worlds. He will, because of what he did, again have to accept a material body to perform therewith activities that [again] cause him great grief in the future. What happiness would someone find swearing by activities that invariably lead to death [see also 5.26: 37 and B.G. 16: 19-21]? In all the worlds exists fear of Me [in the form of Time] among all their leaders; the individual souls living as long as a kalpa fear Me and even the one supreme, Brahmâ who lives for two parârdhas, fears Me [see also 1.13: 17-20, 3.8: 20, 3.11: 33, 3.25: 42, 3.26: 16, 3.29: 37, 3.29: 40-45, 5.24: 15, 5.24: 28]. The material senses, stimulated by the modes of nature, give rise to activities and the individual soul, the jîva, who is fully engaged by the materially oriented senses and the gunas, undergoes the various karmic consequences [see also 3.32 and B.G. 3: 27]. As long as there is the differentiation of the modes of nature, there will be the different forms of existence of the soul, and as long as there are these different states of the soul, there will be [karmic] dependence [see also B.G. 17: 2]. As long as one is not free from this dependence there will be fear for the Lord and Controller [who is the Time]. They [then] who enjoy this [karmic bond] will become bewildered and always be full of sorrow. S'rî Uddhava said: 'Even though the one embodied is present in the midst of the modes of nature, he is not necessarily bound to what incessantly operates upon him from the material body [like happiness and distress]. In other words, how can it happen that someone, as a free soul, is caught in the grip of the modes oh Almighty One? *: This philosophy is known to be propounded by the followers of Jaimini Kavi that defend the pravritti mârga of regulated sense-gratification before the nivritti-mârga of activities in renunciation; something to which the paramparâ offering this book, with this verse, strongly opposes pointing out that one is thus eternally stuck, nitya-baddha, in repeated birth, old age, disease etc. The picture is titled: "The gambols of ghosts". 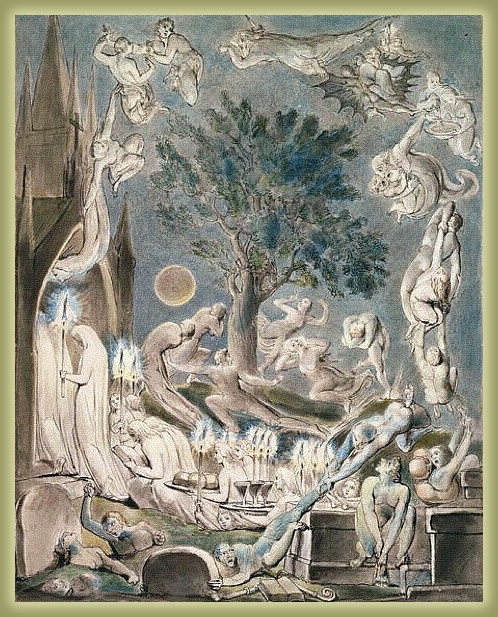 It is an illustration by William Blake to Robert Blair's 'The grave'. Source.